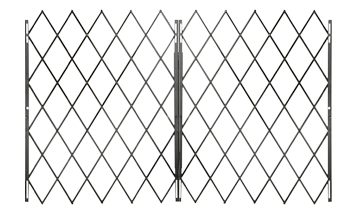 Wholesale Gate Company has been manufacturing steel folding security gates for more than 45 years. The mission of our business is to make a quality product at a competitive price that meets or exceeds our customers' requirements. Wholesale Gate Company manufactures the "classic" design of folding gate that has been around for years and proven over and over to be durable and dependable. 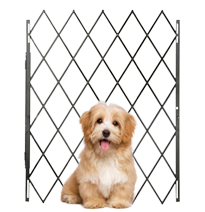 Our folding gates are made of 3/4" wide 14 gauge steel channel, riveted back to back with solid steel rivets. Solid rivets provide abundant strength to last longer under any conditions. 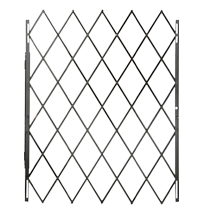 We use 1-1/2" x 1-1/2" x 1/8" thick hot rolled angle iron for upright gate rails that resist abuse and last longer than thinner alternatives. Our drop pins are made of 5/8" round rod and our casters are steel. We thoroughly coat our gates using black enamel paint. Click on the gates for more information about that gate.